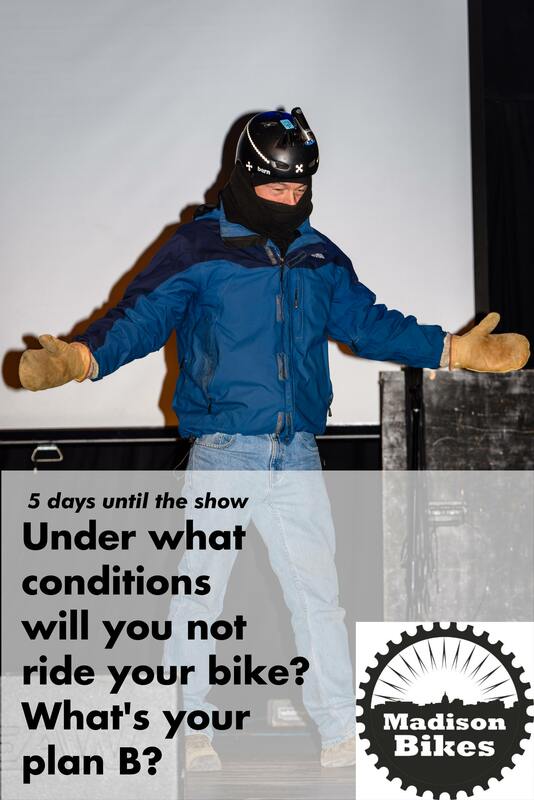 Of course, the big event coming up this week is the Winter Bike Fashion Show. We’ve been reminding you about it for weeks now, but we don’t want you to miss all the fun. Remember, it’s at the High Noon Salon on Saturday, December 9 at 1:00 pm. Bring your friends and family! We have a countdown on our Facebook event page, with one winter-cycling-related question a day. But there are more winter cycling events this week, as well as some fun rides and of course, city and neighborhood meetings. It’s another casual ride around Lake Monona to keep your blood moving during the cold weather. Meet at Ford’s Gym, 2114 Winnebago St at 7:00 pm for the weekly MEAThead ride. This is a no drop, Lake Monona loop with optional loop through Arboretum. Madison Bikes Communications Committee meets from 5:30pm to 7:00pm at the Memorial Union - Sunset Lounge. Dream Bikes has open shop hours from 6pm to 8pm. Want to work on your bike but don’t have the tools or the mad skllz? Ride over to Madison Dream Bikes, 4245 W Beltline Hwy, for open shop hours. The University Bike Resource Center will offer some tips to keep you “Biking Through Winter” It’s a brown bag, so you can bring a lunch. Noon–1:00 pm, University Bicycle Resource Center in the Helen C White garage, 600 N Park St. Join veteran winter cyclist and Madison Bikes board member Chuck Strawser for tips on biking through the winter. Suggestions for clothing and other gear plus basic winter maintenance tips and available resources. Free Planet Bike blinky light set to the first five attendees. 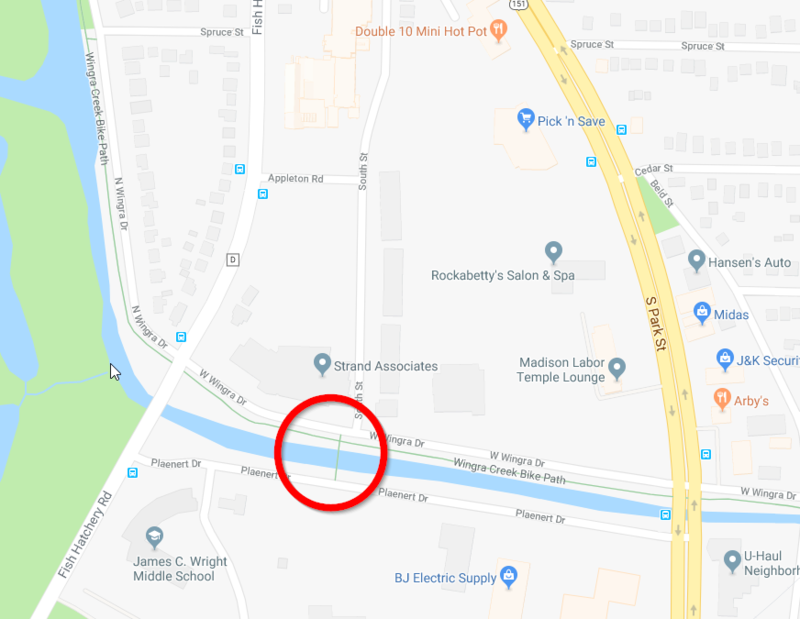 If you are interested in hearing about the plans for the replacement of the Wingra Creek bridge just east of Fish Hatchery Rd, there will be a meeting about the plans 3:00–4:00 pm at Strand Associates, 910 W Wingra Dr. This bridge offers a nice alternative to cross Wingra Creek for those who want to avoid the turn lanes at Wingra Drive and Fish Hatchery, or those accessing Wright Middle School. If you are unable to attend, please direct questions or comments to Lisa Coleman (lcoleman@cityofmadison.com or 608-266-4093). If you want to hear about transportation plans for the entire metropolitan region, then check out the Madison Area Transportation Planning Board Meeting: 6:30pm – 8:30pm, Water Utility-Engineering, 119 E Olin Ave, Madison. Two items are of particular interest to Madison Bikes; a discussion of the autonomous vehicle testing corridor on Park Street and a discussion of the results of a bicycle level of stress analysis. The result of the Environmental Impact study WisDOT has completed for the terribly flawed and bike/pedestrian-unfriendly project it is proposing on Stoughton Road is also up for discussion. The full agenda is at the link above. To pregame for the Winter Bike Fashion Show, join the Santa Cycle Rampage, starting at 10:30 am at Paceline Indoor Cycling, 601 N Whitney Way. It runs about two hours, or until it’s time to go to the big event. Winter Bike Fashion Show: 1pm-4pm; High Noon Saloon, 701A E Washington Avenue. Do you love to ride your bike in winter? Have you discovered the secret to staying warm and dry? The Winter Bike Fashion Show will return to the High Noon Saloon for its 2017 edition on December 9 at 1pm. Whether you’ve been riding a bike in the winter for a long time or are just curious, come join us. Share your expertise, your excitement for winter riding, and celebrate the season with others at a family-friendly event. Free admissions, cool door prizes, and Madison Bikes winter t-shirts for sale! RSVP on Facebook or just stop by.